A Palestinian youth was killed on Wednesday after he was shot by Israeli forces in occupied West Bank, according to the Palestinian Ministry of Health. "Musab Firas Tamimi, 17, was killed after he was shot in the neck from short distance during clashes with Israeli troops in Der Nitham village of northern Ramallah city,” Palestinian Ministry of Health said in a statement. The Israeli army claimed that the Palestinian was shot after the soldiers "noticed he was holding a gun,’ a claim that was never verified. The army said that the soldiers instantly used live fire against the Palestinians, when they saw the alleged gun. 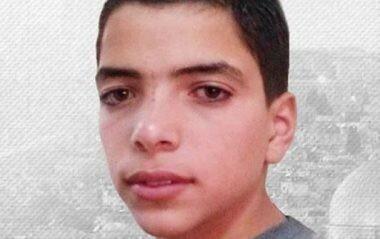 Mos’ab’s father said that the soldiers detained a teen who suffers from a mental disability, and that he and other Palestinians went to the soldiers to secure the teen’s release. He added that he was near the teen when the soldiers shot his boy in the neck, from a short distance of 5 – 6 meters, and killed him. After killing the teen, the soldiers imposed a strict siege on Deir Nitham, prevented the Palestinians from entering or leaving it, and cut the power supply to the village. "Another Palestinian was injured, while dozens more suffered from teargas inhalation,” it added. Tensions have mounted in the Palestinian territories since U.S. President Donald Trump recognized Jerusalem as Israel’s capital on Dec. 6. The move drew widespread condemnations from across the Arab and Muslim world and sparked angry protests across the Palestinian territories. Since Trump’s announcement, at least 16 Palestinians have been martyred and thousands more injured in clashes with Israeli forces in the West Bank, East Jerusalem and Gaza Strip.